This is the second in a series of GeekLists where I get to spout off about my favorite board games of each year. I've already covered the years of 2001 to 2010. Starting in 2011, I'll devote a single GeekList to a whole year of games, and I'll go through some honorable mentions as well. I had a few personal crises in 2010, and I remember that year feeling very monochromatic and drab. 2011 is the year that the color started to return to my life, and it started with the games. The games in this list were quite unusual. They presented strange gameplay twists that helped ease me back into the hobby. I'm really grateful for them; I can't imagine another year like 2010. Why now and not the end of the year? Because all the games I'm interested in come out in October for Essen. Why give myself only three months to play all these games? In order to be eligible for an award for a given year, a game must have come out no sooner than October of the previous year and no later than September of the given year. Also, as much as it pains me to write this: games I have designed are not eligible for a Frantic Ferret. Keep in mind that only games released between Essen (October) 2010 and September 2011 will qualify for this particular year. So my definition of "year" may not line up with other awards. I might be a little biased here, because I'm friends with Seth Jaffee, the designer of this really incredible game. But Eminent Domain was one of the first deckbuilding games that didn't play like an LDB (an LDB, dear friends, is a genre I like to call "Like Dominion, But..."). Seth calls this a "deck-learning" game, and that's a pretty apt description. The more you perform a role, the "better" you'll get at that role by drawing more cards corresponding to that role. It's a strange game that I really enjoy, despite being completely awful at. I honestly haven't been terribly into most of Uwe Rosenberg's stuff since Agricola. Le Havre and Ora et Labora were decent enough, but didn't blow me away. Gates of Loyang bounced right off of me. But this strange, weird, dry little game has stuck with me. It's a pickup-and-deliver game with an extremely abstracted, streamlined board. Time is a currency, and the game rewards efficiency. There is a little bit of the ol' luck of the draw here, but the game is actually pretty fun. The only caveat is that I prefer to play without the rule that randomly removes a good from every player's board every few rounds. That's a bit of chaos that I don't think flatters the game at all. Martin Wallace was one of the first designers who really showed me how fun economic games could be. I wouldn't call London one of his top games, but it is a really good one. The card mix is quite intriguing, and the way the game models London's regrowth after the great fire is nifty. Plus, the kind of planning it rewards is really fun. In my limited number of plays (compared to the game's playtesters), it seems that the strategy of going into debt early to buy lots of boroughs, and only running your city a few times, is the way to go. But I think I'd need a few more plays to really confirm that. This game won the coveted "IngredientX's favorite game of BGG.CON" award, but it's been tough to get to the table. My group at the time wasn't crazy about spreadsheet games, and my life was chaotic enough that I had to take what I could get. But it would be fantastic to get this number back onto the table. 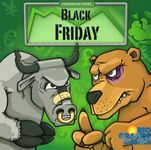 I don't think there's another game that models a collapsing stock market quite so well. I had my head in my hands for most of my first play of this game. Which way to go? Build or ship? Get another person? Spend a person on a privilege? I had played a couple of rondel games before then, but none had really grabbed me the way that this one did. As disorienting as the first play was, every subsequent play got better and better. My friends who played it wanted to play it again. There's so many tense, juicy choices. This one might seem like a slam-dunk, but it's a little tricky considering this a "family" game. Gamer geeks howled when the SdJ jury nominated this game for the Kennerspiel des Jahres instead of the flagship Spiel des Jahres, but I completely understand why. 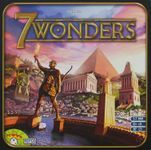 I've had success teaching games like Dominion to my non-gamer friends, but 7 Wonders leaves most non-gamers scratching their heads. There are so many ways to score, and the Science scoring is so complex, and there are so many cards that rely on other cards, that this is not a game I would show to just anyone. And yet, for people who are familiar with games, this is such an easy, light game to play. Decisions are interesting, but rarely overwhelming. Games are quick but meaningful. It's one of the few games to play well with seven players and still offer real solid strategic decisions. Ultimately, in order to qualify for the Frantic Ferret Best Family Game award, I have to show a candidate game to my friend Midge. She is an enthusiastic and smart gamer, but she will freely admit that her attention span is not too big. If Midge gets fidgety during a rules explanation, that's my warning sign that the game I'm explaining is not a family game. Midge was totally content and comfortable during this game's rules explanation. And of course, she and her husband requested it several weeks in a row. That settles it: according to the Frantic Ferret jury (i.e. me), this qualifies for Best Family Game. So, now that I've handed out hardware for 2011, how do other games that won awards this year compare? Quirkle won the Spiel des Jahres, although it had been out in the US for a few years by then. I only played it once just after it came out, and I wasn't impressed. It seemed to be vitally important to not place a fifth shape in a row, and yet there were times that couldn't be helped. I just couldn't get into that sort of decision-making process. Not for me, I'm afraid. I never got around to Dominant Species, which won the 2011 Golden Geek. I'm not a huge fan of thematic games with rich, chrome-heavy rules and chaotic gameplay, especially if they use a gang-up-on-the-leader mechanism to prevent one player to get too far ahead. This will probably lose a few readers, but hey, they are my awards, after all. The three Meeples' Choice winners were Castles of Burgundy, Ora et Labora, and A Few Acres of Snow. Castles of Burgundy isn't a bad game, but it lacks the quick gameplay I love in most Feld games. It bogs down quite easily. If it were 30-60 minutes shorter, I would rave about it. I like A Few Acres of Snow enough to consider it for a rare Frantic Ferret 2-player award, but I just never get it on the table enough, not even enough to mess around with the supposedly broken "Halifax Hammer" trick.